Commercial crates are important to the day-to-day operations of many businesses. Commericial crates can be built as one-of-a-kind or a multiple production-run of custom wooden crates for your commercial business. Our company can manufacture custom commercial wooden crates that are quality bulit to get your important and valuable cargo safely to it's destination, whether across town, or across the country. Your business depends on reliable sources for commercial crates and Caseworks Crating and Shipping has been reliably manufacturing quality custom commercial crates for many years. 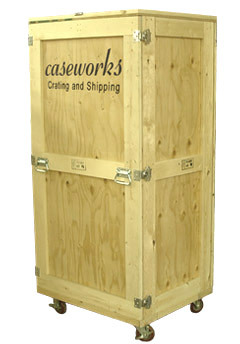 Our customer service is outstanding in proving the exact commercial crate you require for your business. Some examples of commercial crates featured below.